Geese swooshed westward, tree-top high. Over the next few minutes, occasional kehonks told of a big swing out over the River Raisin’s bottomlands, then to the south, then back east and off into oblivion. The calm air felt cool and damp and smelled thick with the wormy aroma of wet, rotting leaves. Slow and deliberate, buffalo-hide moccasins whispered over crunchy oak leaves—up onto the ridge crest then north on an old doe trail that saw little use that fall. The trail dipped, offering a brief downhill advantage over a spacious raspberry thicket. Impaled oak leaves created a thin roof over the tangled purple switches. Looking away with head half-drooped, a small, solitary deer lay just inside the south edge, shadowed under the oak-leaf blanket. That late-afternoon still-hunt progressed up the rise, across a tiny clearing and on to the down-wind side of an early-winter path that meandered through the storm-twisted remnants of a poplar stand. Fourteen paces downhill the carrying-strap-bound blanket roll thumped between two close-growing red cedar trees. I sat cross-legged on the blanket roll, and in less than a minute, three deer appeared, well to the west, plodding single file, displaying little concern. The trio angled south, then disappeared behind a small knob in the hardwoods. I struggled to gain another sighting where the knob melted into the hillside, but to no avail. A wild turkey hen uttered a soft “putt,” up over the ridge to the northeast. A faint “arrkk” came from the south, farther down the east slope. Intermittent gathering sounds from wild turkeys on their way to the night roost frittered away another twenty or so minutes. Then a big doe and a scrawny, late-summer fawn walked in from the west. They, too, slipped behind the knoll, but reappeared, circling around the knob while angling uphill, a good 40 paces distant. Darkness rolled over the hardwoods with a cold, chilling vengeance. A single, four-legged greyish mass, thick-necked and walking fast with its nose to the ground, materialized at the base of the knoll. The deer might have looked south, then north; I struggled to keep sight as its fading silhouette evaporated into night’s inevitable abyss. Such was a humble woodsman’s circumstance on the 15th of December in the Year of our Lord, 1798. Three days before, I sat against a fair-sized red oak on the north end of that same ridge. Back to the right, down the hill and across an open, sweeping valley, neighbor Jeff, also a traditional woodsman, stalked south following the river bottom’s irregular, swampy edge. He paused, looked in my direction, then offered a modest wave, acknowledging my presence. I waved back, but then expended a hearty, discouraged sigh as the gravity of the situation became apparent. Later that morning Jeff confirmed my suspicions. “It was easy to see you in that yellow shirt,” he said, which was not what I wanted to hear. 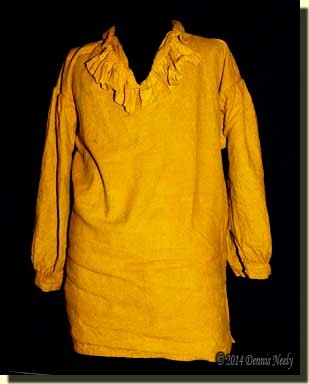 I had over-dyed the linen outer shirt to tone down the brilliant yellow color, but the treatment was not enough. To start at the beginning, two weeks earlier my first attempt at dyeing the hand-sewn linen shirt ended in failure. A boiling pot of stinging nettles added no color to a test swatch; disappointed, I never immersed the whole shirt. After further study, I think the nettles were gathered at the wrong time of year, but that didn’t lessen the frustration. However, while seeking an historical explanation for the nettles debacle, I happened upon a brief mention of professional dyers in the 18th and 19th centuries using turmeric, an organic dye from India, to produce a bright yellow (Adrosko, 37). After spending hours hand-sewing the trade shirt, I wanted to use an authentic dye. A green or grey were my first choices, browns as a last resort, but I never considered a yellow tone, much less bright yellow. It took a while to warm up to that idea, but after all, given my past failures with wild grapes, mint leaves and pokeberries, to name just a few, the ominous specter of resorting to “Rit-berries” acted as a powerful motivator. As I so often do in the wilderness classroom, I sat down and evaluated the methodology used. In each of the failed attempts, I assumed the old recipes worked as written, and I set about concocting a “full batch,” sufficient to dye more than one shirt, which consumed hours of effort and compounded the end-result frustration. Not wishing to repeat past mistakes and waste a lot of time, I chose to change my process for the turmeric. Instead of using a large kettle, I peeled the paper labels off two commercial-sized bean cans. After filling each can with four cups of water, one quart, I set them to boiling, along with a tea kettle. Next I picked a recipe from those I had found and multiplied the gallons listed by four to convert from gallons to quarts. I multiplied the ounces of powdered turmeric by six to convert to teaspoons and divided the teaspoons by the number of quarts, producing the correct ratio of turmeric to water. Then I halved the calculated powder amount, measured it and added it to one can of boiling water, thinking I would test the dye at half-strength, full-strength and if necessary, one-and-a-half times the stated amount. After writing all of these measurements down, I converted the first mordant, or dye fixative mixture, that I intended to experiment with to the quart basis. One recipe left the impression that a mordant wasn’t necessary, and none of the others listed a recommended choice so I thought I would try alum, alum and cream of tartar, baking soda and salt. I added the calculated amount of alum to the second can. Next I cut small linen rectangles from the fabric left over from the shirt, divided them into two equal piles and clipped a corner of those in one pile. I placed three un-clipped-corner swatches in the mordant bath and three clipped-corner swatches in a Pyrex dish filled with boiling water from the tea kettle. I allowed the swatches to soak in the mordant bath for 30 minutes. 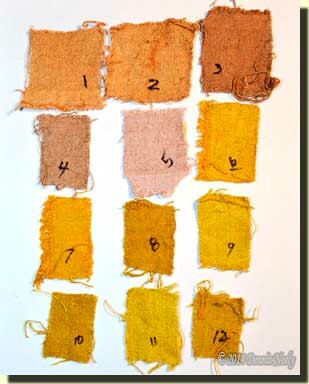 I selected a sample from each group and immersed them in the turmeric dye bath for 30 minutes, retrieved them with duck-billed pliers, and placed them on folded paper towels next to a penned number that matched the information recorded on the paper. I added another half-teaspoon of turmeric to the dye bath, and when the orangish-yellow powder had dissolved, I repeated the process. As the swatches dried, I marked the “batch number” on each with a Sharpie® marker. By setting a timer, I was able to work in my office between batches, instead of watching the pots boil. About two batches into the experiment, a revelation hit me that I should add a bean can for logwood—all I needed was more test swatches. Then I started mixing equal amounts of the logwood and turmeric dye in a smaller bean can, just out of curiosity. At the end of the “laboratory session” I had a modest assortment of swatches, some about the same color and some quite different in tone, depending on the mordant (or absence of a mordant) used. Instead of dealing with an 18th-century recipe and a vague description of the end result, I came away from that afternoon’s classroom lesson with a list of specific formulas and an in-hand example of what each dye lot produced. In the past, I saw success with staghorn sumac and walnut hull dyes, but as with the stinging nettles, I bulled into the process and got lucky. The failure of the nettle dye pushed me into re-thinking how I was approaching the 18th-century learning experience. By undertaking a methodical approach, I achieved success with turmeric and logwood and combinations thereof. Sometimes, as living historians, we need repeated failures to bring us back to the reality that every sojourn, no matter how large or small, is an experiment in re-creating the past. The turmeric/logwood mixes produced a drab green, which is what I was originally after, but I was so intrigued with the yellows the turmeric produced that I picked a sample that I thought looked good and set about dyeing the linen outer shirt. 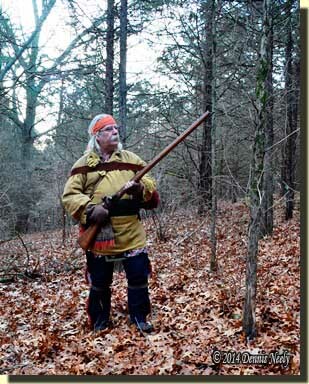 Think about your traditional hunting methodology, be safe and may God bless you. 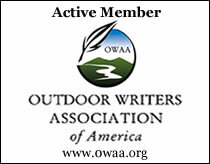 This entry was posted in Clothing & Accoutrements, Deer Hunts, Wilderness Classroom and tagged Black powder hunting, Dennis Neely, historical trekking, Native captive, North West trade gun, Northwest trade gun, trade gun, traditional black powder, traditional black powder hunting, traditional blackpowder, traditional blackpowder hunting, Traditional Woodsman. Bookmark the permalink. You aren’t the only one to make a mistake along the way. I once tried to redye my favorite red weskit only to remove it from the wash machine about a size 1. Seems you can’t wash them in hot water. I thought it would take the dye better. I did get to save the pewter buttons. Trial and error. Ouch! You are right, sometimes lessons are painful and costly. That’s how we learn not to wash in hot water or use the warmer settings on a dryer. I only use the dryer on the lowest setting and then to remove about half of the moisture. I prefer to hang my garments outside to dry.Thanks for the tip! Play with samples first, because the turmeric gives a brilliant yellow which, in my opinion, needs to be toned down for turkey hunting. I am considering trying 1/3 turmeric to 2/3 logwood for another hand-sewn linen shirt I have. And if I do that, I’ll do a post about the results. Please do,,you seem to be braver than I + my missus will scalp me in my sleep if I mess up her sewing’s !! I understand; there is nothing wrong with respecting someone else’s hard work, especially a wife or close family member. I do my own sewing, so if I make a mistake, I’m the one held accountable. Now a shirt dickered for off a trade blanket or purchased online or from a vendor is another story. Plus, there is nothing wrong with copying the trial-and-error results of someone else’s wilderness classroom lessons, which is why I share my first-hand experiences.